This vegetarian and vegan recipe for a hearty homemade barley and vegetable soup is both healthy and filling. A meal in itself, you can add just about any veggies you want. 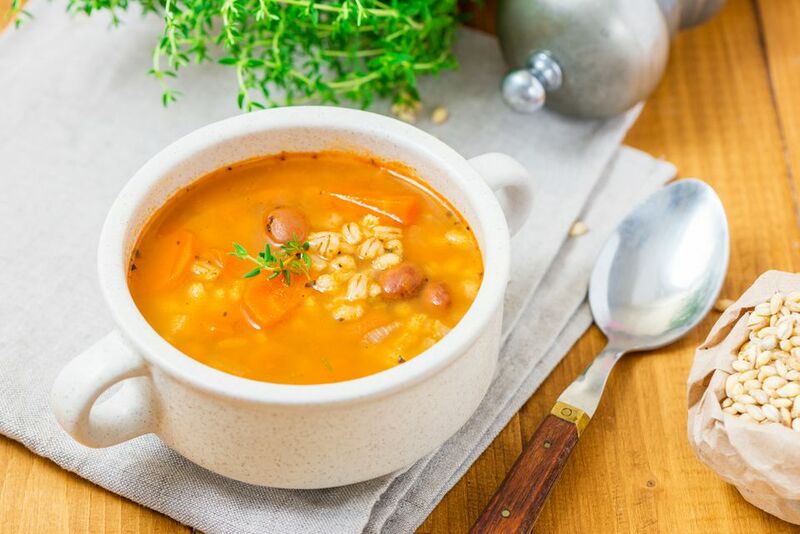 If you're used to a more traditional beef and barley soup, go ahead and try this lower-fat and cholesterol-free version of a vegetarian bean and barley soup - you definitely won't be disappointed at all! This simple and healthy soup recipe makes a more than ​a generous amount, so plan on having some leftovers! If you like cooking with healthy whole grain barley, particularly in soups, you may also want to try this basic vegetable barley soup recipe. Looking for more simple, healthy and nourishing vegetarian and vegan recipes? You can browse through all the vegetarian recipes here, or all the vegan recipes here. In a large soup or stock pot, sauté the onions and garlic in the oil or vegan margarine for a minute or two. Then add the celery, carrots and any other vegetables you are using for about 3 to 5 minutes. Next, add in the vegetable broth or water and all the other remaining ingredients and bring the mixture to a simmer. Once your soup is simmering, reduce the heat to medium-low and cover your pot. Be sure to remove both of the bay leaves before serving your soup. Taste, and then add in more spices or a bit of optional salt and pepper to taste. Feel free to add any type of vegetables you favor to this barley and vegetable soup. We think that green beans, peas, and corn are some great additions.